For a century, Chinatown has been the center of a tight-knit Chinese community. Located just below the South Loop, Chinatown offers a variety of restaurants, amenities, and cultural centers that offer authentic experiences to residents, visitors, and ex-pats of all backgrounds. Chinatown is conveniently close to downtown Chicago, so you’ll just be a train or bus ride away from anything else you need. As your Chinatown movers, we’ll help you settle stress-free into your new neighborhood, letting you start finding your own favorite spots right away. About 11,000 people live in the Chinatown area, with an even gender balance. Many folks are older, and have roots in the neighborhood that go back generations, but there is a mix of ages. There’s also a sizable number of families with children. Chinatown, in its location today, first began to establish its identity around 1915. Before this, Chinese immigrants who had moved from California were establishing businesses and communities in Chicago. In the 1920s, residents began to build monuments and other structures that solidified their neighborhood’s identity, along with founding organizations that remain today. Ping Tom Memorial Park: Community spaces, river access, and boat rentals. Chicago Chinese Cultural Center: Events and outreach. Chinese-American Museum of Chicago: The immigrant experience, community events. Chinatown Square: Tw0-level mall with restaurants and store. Hoypoloi Gallery: Distinctive art and decor for sale. 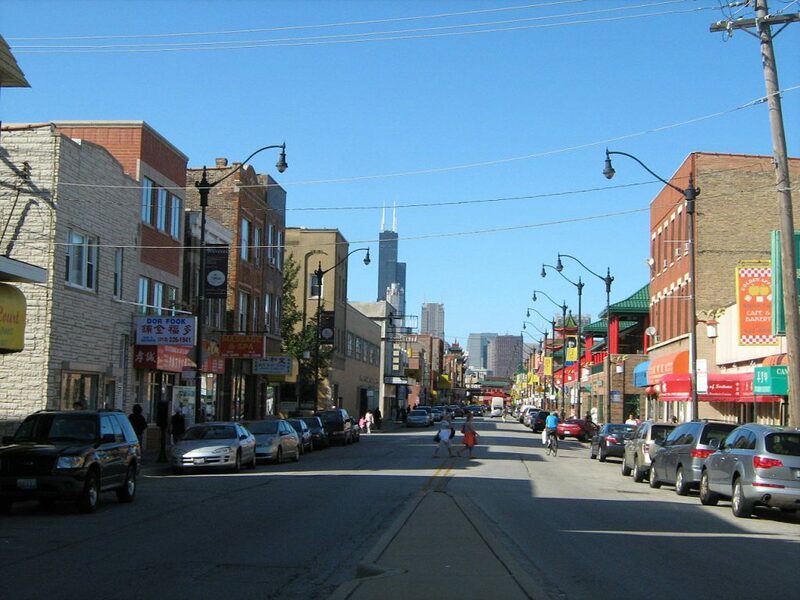 Chicago Chinatown Chamber of Commerce: For community events and information. A variety of Chinese options. Trendy: Go 4 Food. Michelin-starred. Upscale: Dolo Restaurant and Bar. Fusion cuisine in modern setting. Groups: Ming Hin. Big tables and full bar. Seafood: Emperor’s Choice. Creative preparations. Open Late: Triple Crown. Sit in or delivery. Ramen: Strings Ramen. Some of the best in the city. Cocktails: Velvet Lounge. Long-time night club. Karaoke: Sakura Karaoke. Private rooms available. Food: 15/20 Lounge. Karaoke as well. Live Music: Reggie’s Chicago. Lots of shows, beers, and food. Park to Shop Supermarket: Lots of options, Asian focus. Chinatown Market: Seafood counter and more. Captain Cafe and Bakery: Chinese pastries and desserts. TBaar Bubble Tea, Juice, Smoothies: Hot and cold beverages. FFC South Loop: Equipment, classes and spa. Dre’s Diesel Dome Fitness: Variety of group training. This has been a tiny sampling of the great things you’ll experience at your new Chinatown home. As a seasoned Chinatown moving company, we’ve learned all about the staples and cool places in the area. We’re happy to share more! As you’re planning your big move, cross one major thing off your to-do list, and book Chinatown movers who’ll a take load of stress off your mind. Call us at New City Moving, and we’ll help you move safely, smoothly, and on-schedule, so you can settle right in and start living your greatest Chinatown life.